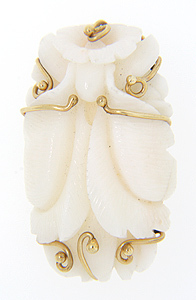 14K yellow gold wire frames a lovely white coral carving of a flower. The wire frame is hand made and the coral is hand carved. The pin measures 1.5” tall and .9” wide. Circa: 1950.